Considered one of the most knowledgeable bloodstock advisors in the industry, Suzanne coordinates the equine analysis efforts at EQUIX. She works closely with our clients to select the best racing and breeding prospects, as well as optimal matings for their mares from stallions in our database. 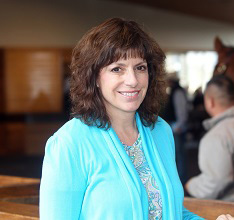 From a background with horses-in-training, Suzanne began her career at EQUIX in 1986 as an Equine Analyst. She examined and measured horses for clients at sales and at farms, ad soon mastered our programs to evaluate racing and breeding stock. In addition to spearheading our selection and field work, she applies her unique knowledge of biomechanics to prepare a quantitative analysis of horses based on the results of EQUIX's premier computer programs. EQUIX adds an edge to all areas of bloodstock services - yearling selection - video analysis and two-year-olds in training - breeding evaluations - matings - and cardio reports. Suzanne's great horsemanship and EQUIX services offer clients a unique combination of expertise and biomechanics to make the best bloodstock decisions possible. Jolene comes to EQUIX with an extensive background as a Veterinary Technician. Originally from Kearney, Nebraska, Jolene’s equine experience started at a young age with her family’s farming operations. Working with all types of horses with a focus on equine health and veterinary procedures, she holds a Bachelor of Science degree in Equine Science from Colorado State University. She later earned an MBA after moving to Kentucky. Jolene worked for several large veterinary groups in the Lexington, Kentucky, area as a veterinary technician and as a tech supervisor. Her experience with medical care, soundness, and ultrasound technology combined with her naturally scientific mind make Jolene a perfect fit to oversee EQUIX’s Cardio Analysis and endurance predictor service. Jolene will continue our important work in Cardio Analysis, which we introduced in 1991, and our ongoing research in this field. As an Equine analyst, she will also participate with the measuring aspect of our Biomechanical Analysis, our Stride Analysis, and assist in screening two-year- olds and yearlings at auction. Jolene resides near Lexington with her husband Stephen. They own and enjoy riding their two Quarter Horses and two Thoroughbreds.